Have you been by the corner of First Street and Olive recently? Remember that ugly structure where you parked when you had jury duty? 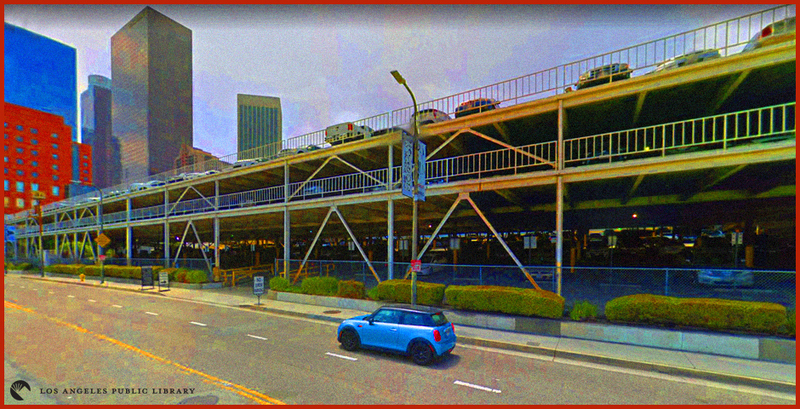 Familiarly referred to as the Erector Set or Tinker Toy garage, the infamous parking structure is no longer there. Seemingly overnight it was torn down and replaced by crews doing pre-construction on The Grand, a mixed-use complex designed by starchitect Frank Gehry. Owned by the County of Los Angeles, the garage, officially known as Parking Lot 17, was never meant to last more than a couple of years. It was meant to be a cheap, quick, and temporary solution to the severe parking shortage in the city center. A 1966 survey found there were only 81,000 parking spaces to accommodate the more than 250,000 cars entering the area each day. The 800-car garage was built in just a couple of months in 1969. The price tag was $850,000. The “revolutionary concept” was conceived and marketed by industrial engineer Charles Bentley of Portable Parking Structures, Inc. His prefabricated modular system consisted of concrete floors with embedded connectors that could easily be joined with support beams and columns. Put together like an Erector Set, the structure could be taken down and moved as needs changed. The revolution, however, was short-lived. PPSI built only two dozen or so of these portable structures. Not one of them was ever moved. Even before the garage was built, it was subject to a rousing chorus of derision and dire warnings that the structure would have a “deleterious effect on the fabric of the city.” Time magazine wrote of PPSI’s structures, “Their appearance—which is most charitably described as functional—does not do much to improve the aesthetics of a neighborhood.” Richard G. Mitchell of the Community Redevelopment Agency feared the erector set appearance of the garage would hinder the CRA’s Bunker Hill Urban Renewal project. Critics also suspected that the temporary structure might not be so temporary. Architect Eugene Hougham went so far as to suggest the city and county put up bonds to guarantee its removal. Public opinion did not improve over time. Parking Lot 17’s unsightliness became all the more apparent as the surrounding area was developed and architectural standouts such as Disney Hall, the Cathedral of Our Lady of Angels, and the Broad sprung up around it. When Parking Lot 17 was built, few people lived downtown and Bunker Hill was “really just a big office park.” Now, downtown L.A. has over 70,000 residents and Bunker Hill has become a cultural destination. In the works for over ten years, The Grand is seen as the last large piece of the decades-long Bunker Hill redevelopment. Designed by Frank Gehry to complement his Disney Hall located across the street, the current plan calls for two towers with 436 residential units and 309 hotel rooms, plus retail, restaurants, and movie theaters. And five levels of underground parking. Developers originally hoped to break ground in 2007 but the global recession and other issues delayed the project. The official groundbreaking for the $1 billion development is now set to take place in early 2019. Artist rendering of "The Grand"
It is somehow fitting that in Los Angeles, where nothing is permanent, something meant to be temporary lasted nearly 50 years.